On May 3, the Instrumental Music Conservatory at California School of the Arts-San Gabriel Valley had its final concert the Season Finale. 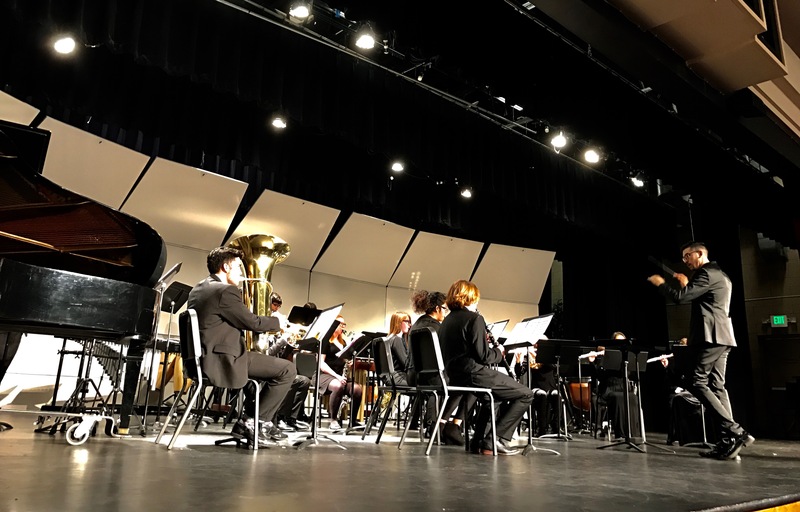 The Season Finale showcased everything the students had learned and worked toward together throughout the year, featuring the Wind Ensemble, the Jazz Ensemble, and the Philharmonic Strings. The ensembles played a variety of selections o f music from ”Palladio” to “Cafe 512” to “I Left My Heart in San Francisco.” The night also featured awards and a musical presentation based on the children’s books “Mortimer” by the elementary school students in the Dragon Kim Foundation, which provided the CSArts students an opportunity to volunteer as student mentors for elementary students. The program offered a unique community outreach experience for the CSArts students and an immersive introduction to music for elementary school students. “Seeing the kids open our performance for the conservatory not only made me adore them, but also proud,” said IM freshman Tiffany Chang. Throughout their unique experiences growing together as musicians throughout the year, students in the Instrumental Music Conservatory had a chance to develop confidence in their skills through exploration, taking risks, and guided instruction that focused on important skills such as sound production. For students in the Jazz Ensemble, many students had the opportunity to perform their first improvised solos throughout pieces featured in the Season Finale. For all the students, their classes in music theory, music history, and various performances around the community, such as playing in the pit orchestra for the school-wide musical “Pippin,” performing at Grand Park, and playing alongside the orchestra at Azusa Pacific University gave them valuable skills that they would take with them to their future experiences. “I feel that the Strings and Orchestra program really prepared me for becoming a musician in a professional orchestra,” said IM freshman Danielle Alhuay Gamarra. She was recently accepted to an NYU Strings Summer Program with a scholarship. “As violin principal, I had the unique opportunity to work with others a section leader and striving to become the influence that inspires others. The opportunities [and] performing with the orchestra gave me experience on how to adapt to a new family…We all grew as musicians and came from not knowing each other to loving each other and becoming a family,” Gamarra said. Beyond the opportunities offered, the ensembles include both middle and high school students, allowing students in the Instrumental Music Conservatory to not only work together, but also to learn from what everyone had to offer. “Students come from so many different backgrounds and our technical abilities [are] not all the same…but that’s okay. It shows that we all have the potential [to] improve. If we knew everything, what would there be to learn?” Chang said. “Before coming to CSArts, I was in a music program that didn’t offer much education in the arts, including music…After coming to CSArts, I feel as though I was able to grow as a musician and expand my knowledge much more than that of regular high school. My experience at CSArts is one I am very grateful for and that I will never forget,” Mason said. Even though the concert was on a weekday night, many people came to show their support to all the students and everything they had accomplished over the course of the year. When they left, the Season Finale had shown them more than what the students had learned; the Season Finale showed what it meant to be not just a musician that makes music, but rather a lesson reflected in the school culture that is being built. They showed what it meant to share their talents with the next potential generation of musicians, and what it means to grow both as artists and people. Digital applications for the 2018-19 school year are still being accepted on a rolling basis. Visit sgv.csarts.net/apply for more information. And the Theme for the 2018 Met Gala is… Catholicism?